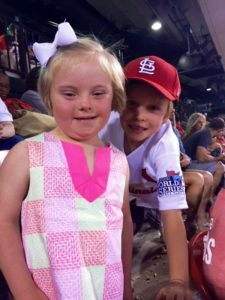 The St. Louis Arc provides opportunities for people with intellectual and development disabilities to participate in activities with their loved ones. Whether it’s taking a cooking class with your sibling or bringing the whole family together for a Family Fun Night, enjoying an activity together is always fun. Bre Ward, Coordinator of Leisure Services, at 314-817-2226. Enjoy cooking with your family and relatives, friends, and support staff, or even with your roommates. 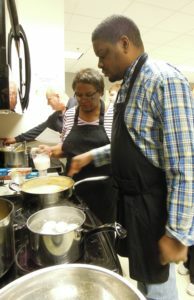 This four week course is designed for you and others to get together and learn all about cooking together. You will walk away with a complete meal that you can enjoy during the class and have leftovers. Our last class will consist of a cooking competition among the groups. For more information, contact Clinton Hall, Coordinator of Leisure Services, at 314-817-2293. Each spring, the St. Louis Arc hosts a St. Louis Arc Night at the Ballpark. We offer tickets at a reduced rate to individuals, families, and staff, and all those in attendance sit together in the same section. An added bonus – a portion of the ticket sales comes back to support the St. Louis Arc! For more information, contact Meghan Murphy, Coordinator of Leisure Services at 314-817-2250 or download a ticket order form. Each winter, the St. Louis Arc hosts an Arc Night with the Blues. We offer tickets at a reduced rate to individuals, families, and staff, and all those in attendance sit together in the same section. An added bonus – a portion of the ticket sales comes back to support the St. Louis Arc! For more information, contact Meghan Murphy, Coordinator of Leisure Services at 314-817-2250. Download the 2019 Spring Summer Leisure Times and Registration Form for a complete schedule of activities.